French actress Isabelle Huppert received a standing ovation at the 44th Karlovy Vary International Film Festival where she was presented with the Crystal Globe award for her contribution to world cinematography on Sunday night. The award ceremony took place shortly before the screening of her 2009 movie Villa Amalia, attended among others by the French ambassador to Prague Charles Fries. 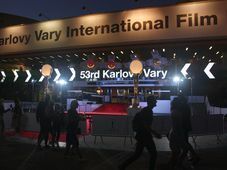 The film festival, now in its third day, has attracted close to 8,000 film fans and over a hundred filmmakers. Among the VIP guests this year are US actor John Malkovich and Spanish actor Antonio Banderas who are expected to arrive mid-week.